The origin of Amalfi does not have many testimonies, but an inscription, “Descendit ex patribus romanorum” confirms that it was the Romans who founded it. 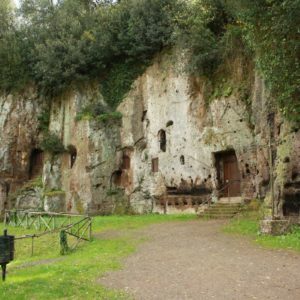 Legend has it that Amalfi was a girl loved by Hercules, then buried in these places at the behest of the Gods. 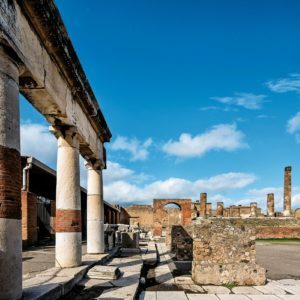 The Romans took refuge there probably because of the Germanic and Longobard invasions, and the town was used as a defensive stronghold of the Byzantine Duchy of Naples. Thanks to the expertise of the maritime experts of Amalfi, the Byzantines maintained a relationship of peace and collaboration with the Amalfi. From the ninth century Amalfi became one of the four Italian maritime republics, and the supremacy over the maritime traffic of the peninsula was contested along with its rivals Venice, Genoa and Pisa. 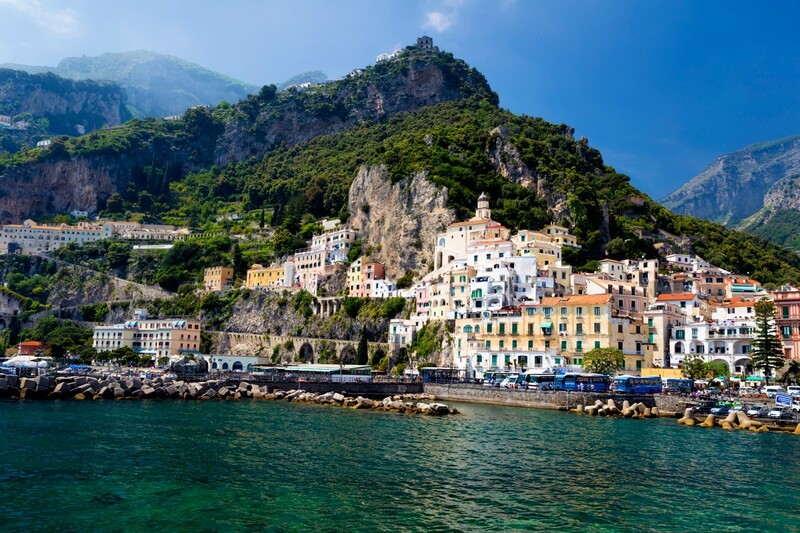 In 1800 Amalfi experienced a sort of rebirth: in 1807, in fact, Giuseppe Bonaparte, who went to visit the Amalfi Coast, recognized its inestimable beauty, and decided to order the construction of a road that connected Naples and the coast. In the second half of the twentieth century, with the economic boom that hit the Italian peninsula, Amalfi along with Naples and the island of Capri became popular tourist destinations. Set against the steep slope of a cliff, along the spectacular Amalfi coast, the ancient town of Ravello, included in the province of Salerno and decreed World Heritage Site by UNESCO in 1996, is today one of the most famous Italian destinations of international tourism , but also, and above all, the place of the soul for intellectuals and lovers of art and culture. As, in addition to the magnificent medieval scenery offered by the city streets and the picturesque landscapes that make it the background, Ravello is always animated by an intense cultural activity, boasting a calendar of events extraordinarily rich, whose culmination is, certainly, the prestigious Ravello Festival, the multifaceted exhibition that animates the historical places of the city almost for the entire year. Founded at the time of the decline of the Western Roman Empire, Ravello was populated around the year one thousand by a group of nobles, against and rebels to the Doge’s dominion, who chose its strategic position, located between the valley of the Dragone torrent and overhangs the sea, to have more possibilities for defense. 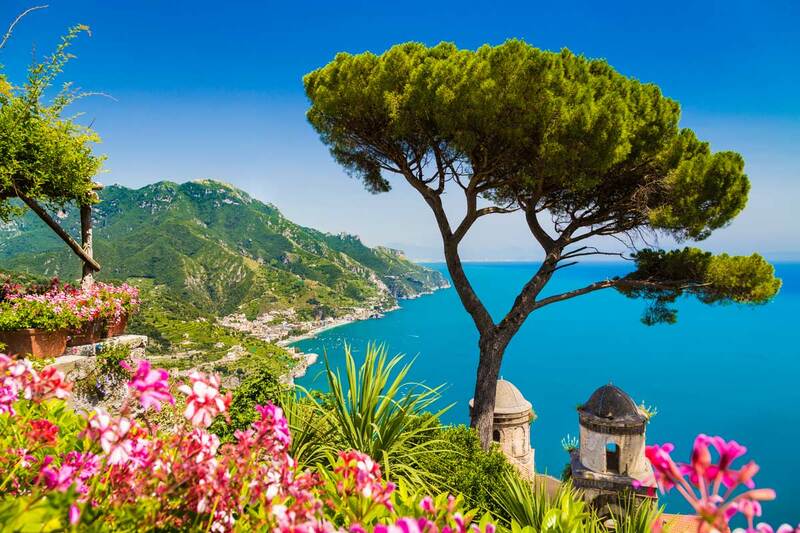 Subsequently, Ravello lived its maximum social, economic and commercial splendor under the Maritime Republic of Amalfi, when it became the residence of renowned aristocratic families. Elected as a bishopric, in about 1100 it reached the role of a real power, to regain success after a period of decline due to the dramatic clashes with Pisa, a particular prestige as a place of elitist tourism, and often become the place of inspiration for the the greatest protagonists of literature and music. 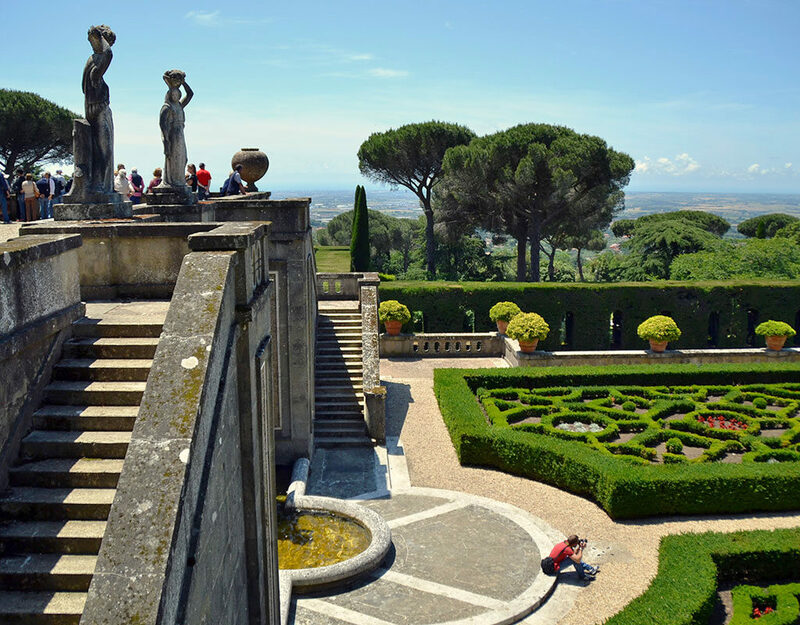 Among the most illustrious guests of Ravello there were the musicians Richard Wagner, who took from the gardens of Villa Rufolo the most beautiful scenes of Parsifal, Giuseppe Verdi, Toscanini and Bernstein. Many writers of passage to Ravello, who described the charm of the city in the pages of their works, so much that already in the Decameron, Boccaccio tells of its gardens, EM Forster places the story of a panic, A. Gide different, in Ravello scenes of the Immoralist, and DH Lawrence some passages of the beautiful novel Lady Chatterly’s lover. Easy to reach by car or by bus, Ravello charms above all for the exceptional beauty of the landscape: the terraces overlooking the cliff, the gardens facing the cliff and the green and transparent sea, villas and monuments. Surely one of the tours of the Amalfi coast with more charm and with artistic and naturalistic beauties. You can start from the port of Naples as well as from the airport but you can still take a day trip from Rome with our comfortable minivans. Our drivers will put you at ease by doing everything possible to carry out an unforgettable tour. The most important monument of Amalfi is the Cathedral of Sant’Andrea, in Arabian style, which comes from an overlap of various buildings, and which is one of the few “composed” cathedrals in Italy. Composed because it is made up of several churches, one next to the other, built in different periods and then reunited. The original building dates back to the 6th century, and was probably built to replace an earlier pagan temple. 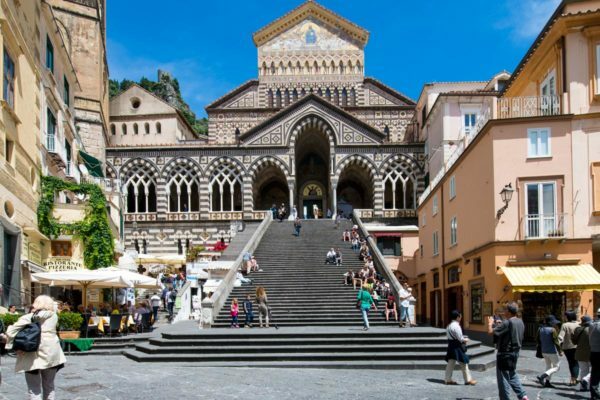 Only in the following centuries, around 750-800, was built a second building, a real cathedral, dedicated to the Holy Assumption of Mary, the then protector of Amalfi. 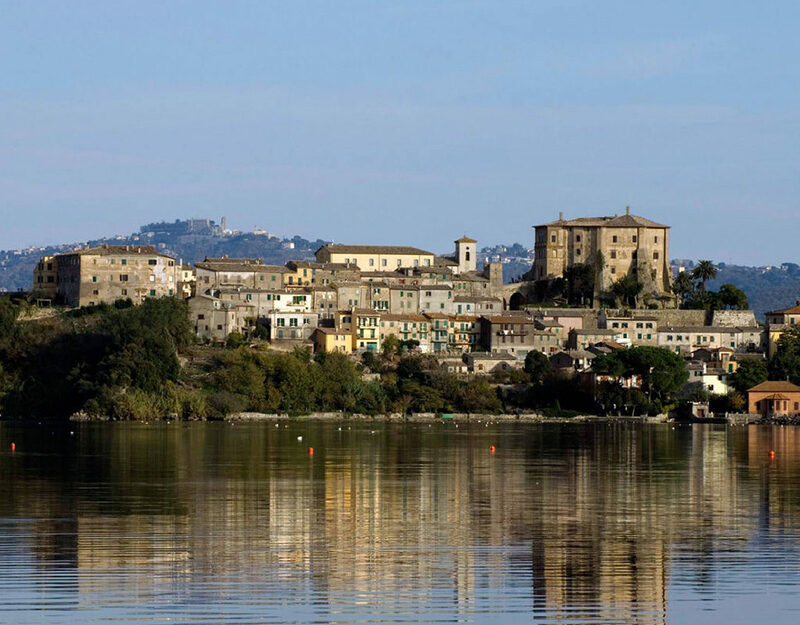 The central body instead, dedicated to Sant’Andrea, was built in the following centuries, by order of Duke Mansone I. Over the centuries several changes were made to the Cathedral, especially in the Middle Ages and Renaissance: among these we mention in particular the altar and the bell tower. 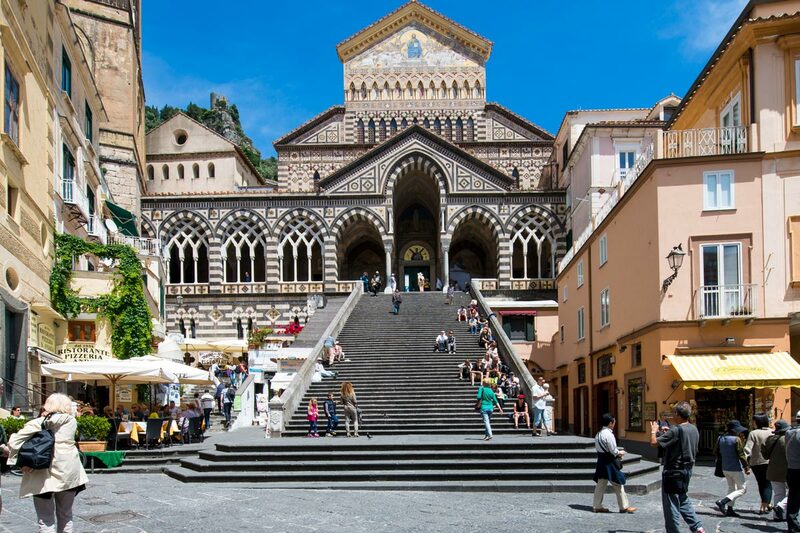 The second most important religious building in Amalfi is certainly the Church of Santa Maria a Piazza, with a Byzantine painting depicting a black Madonna with child. As tradition dictates, every year the Regatta of the Ancient Maritime Republics is held, with the participation of Amalfi along with Pisa, Genoa and Venice. The regatta, which takes place every year since 1854, was created to commemorate the splendor of the Maritime Republics, which from the 10th to the 18th century wrote an important part of Italian history, as well as that of the other countries bordering the Mediterranean. Thanks to their centrality in maritime commercial traffic, they succeeded in considerably improving the local economy, leading to considerable development. The historic regatta of the maritime republics is held every year in one of the various localities: in Amalfi, or in Pisa, on the Arno, or in the Lagoon of Venice, or in the port of Genoa. 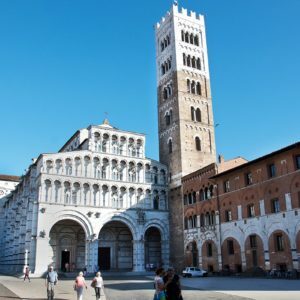 Located in Piazza del Vescovado, next to the Duomo, stands the fifteenth-century Villa Rufolo, whose watchtower still today seems to closely observe the whole city. Built on behalf of the wealthy bourgeois family of the Rufolo, traders at the time known and powerful enough to be mentioned in the Decamerone, the construction passed later passed from hand to hand, until it was sold in the nineteenth century to the Scottish nobleman Francis Neville, who developed restoration, making it as we see it today. The villa reveals in the appearance of several architectural elements a strong influence of Arab culture, in particular in the large Moorish cloister structured with a double loggia and porticoes with a pointed arch, embellished with graceful carved decorations, and in the raised courtyard. The greatest wonder of Villa Rufolo are the magnificent flower gardens, a place loved by Richard Wagner, where today, in the flowery terraces overlooking the blue sea of ​​the Amalfi coast and the gulf of Salerno, the Wagnerian Festival is celebrated in memory of the great German musician , one of the initiatives that has made Ravello the “City of Music” par excellence. 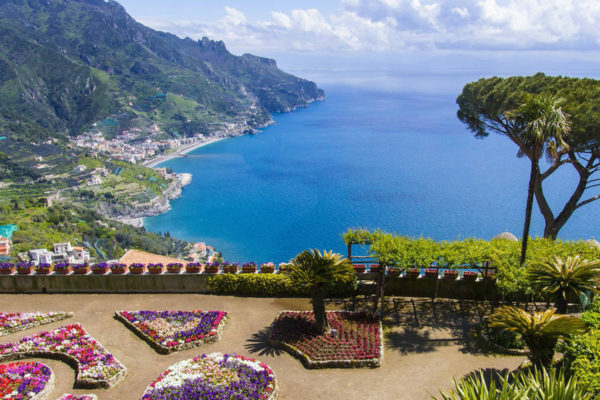 Another beautiful and famous Ravello building is Villa Cimbrone, built on a rock overlooking the Gulf of Salerno, in the place where once stood a Roman villa, later transformed into an agricultural farmhouse. It is a building designed and rebuilt by double hand, Italian and English, by the builder Nicola Mansi and the English lord William Beckett, who magically transformed the ruined farmhouse into a sort of garden of wonders, with a magnificent interweaving of the rigor of the Italian style and the luxuriant frame of the English nobleman, fond of botany. The result, fascinating and highly suggestive, is a mix of local and ethnic styles, a meeting point between the period villa and the antique gallery, almost a travel diary of an explorer transformed into a dwelling. The large park of the villa, in particular, is a labyrinthine path between Gothic and classical architecture, including statues, temples, bridges, caves and fountains, until you reach the fantastic Belvedere of the Infinite, a huge panoramic terrace facing the sublime view of the open sea of ​​the Gulf of Salerno and the coast, a place particularly loved by the writer Gore Vidal. Today the villa is used to host public and private events. The Duomo di Ravello, dating back to the 13th century, reveals artistic pieces of great value and exciting beauty, including the remarkable central portal, made of wood and 80 iconographic panels in chiselled bronze by Barisano da Trani, the magnificent inlaid pulpit marble, sculpted by Bartolomeo da Foggia and, inside the crypt, the Museo del Duomo, where the artistic and historical works are enclosed and a rich archival section that narrate the history of the city.